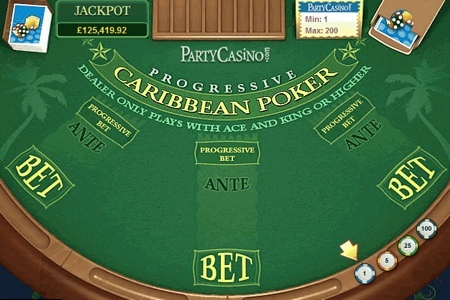 PartyGaming's Progressive Caribbean Poker allows you enjoy Caribbean Poker as normal and to play for a progressive jackpot as an optional side bet. You compete against the dealer with hands formed from 5 cards. Caribbean Poker is played with a standard 52-card deck. Select your chips (from $1 to $100 chips) and place the main bet, known as the 'ante'. You can also place a side bet to qualify for the progressive jackpot and other payouts. Place the side bet either before or after you place your ante bet. You will be dealt 5 cards face-up. The dealer receives 4 cards face-down and one face-up. Choose to either fold or bet. If you raise your bet and have a winning progressive combination then you'll be paid irrespective of the result of the hand: You will win even if the dealer has the stronger hand. If you fold your hand then all bets are lost and any progressive jackpot winnings you have are paid out. The dealer needs Ace-King or better to carry on playing. You are paid even money on your ante and nothing on side bet if the dealer has less than ace-king. You will be paid even money on your ante if the dealer's qualifying hand is worse than yours. You will also be paid an amount on your bet according to the paytable below. The house will collect your ante and your bet if the dealer's qualifying hand is better than yours. A draw, or 'push', is declared if your hand is tied with the dealer's hand.If the two hands have the same high card, the highest card not held in common will be used to determine the winner. Your ante and bet will be returned to you. Royal Flush wins the entire Jackpot. A Straight Flush will give you 10% of it, just like most land-based casinos would offer. Plus Bonus Bet also offers fixed payouts on even lower hands - get paid with a Flush or higher!